Since today is the last day of August and September starts tomorrow, I figured it was time to do some old-fashioned number crunching. Looking at the June-August numbers, what a change from last year! 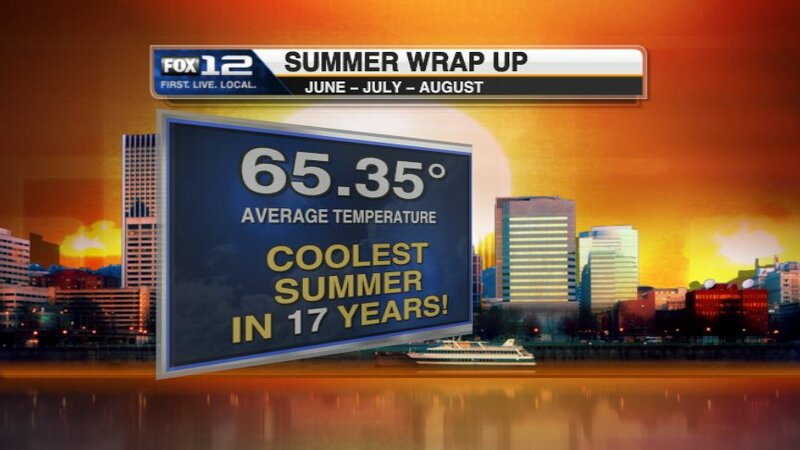 Remember that Summer 2009 was the warmest on record at PDX. Well this year is the coolest since 1993, not in the top 5 coolest, but definitely on the chilly end…predominately held down by the cool and wet June. By the way, before I get any farther, I already had a viewer email me and give the usual “summer isn’t over until late September!”. Well, yes, the calendar says so, but generally meteorologists consider these 3 months the “summer” season. That’s why it’s called “Meteorological Summer”. Okay, what are the other highlights? Other than the well-advertised wet and chilly June; the wettest ever? The other two months were dominated by cooler than average periods dominated by marine air and varying low cloud cover, separated by 3 hot spells. A regular swing between hot and cool…instead of the hot, then warm that we were used to the last few summers. Yet somehow we ended up with 11 days at/above 90 degrees here in P-Town…a few more at Salem and Eugene. The rain is the big story tonight; what a beautiful orographic bit of action in progress. Here at the station in North Beaverton (is there such a thing? ), it’s pretty much dry, yet the eastern suburbs have been soaked by around .50″ of rain. I’ve had about .70″ at my home near Crown Point. Larch Mountain (WA) is up to .96″ at 10:30pm…looks like west slopes of the Cascades will end up in the 1.00-2.50″ range. Orographic is in reference to mountains/topography. Strong flow higher up in the atmosphere coming in from the northwest is rising over the Coast Range, dumping the rain, then rain “shadowing” the western metro area. Then the air rises again into the Cascades, dumping another load of rain there. I love messing up a forecast like today’s. Technically I haven’t put out a forecast since Friday, but I expected rain today just like everyone else, so I won’t run away from that. But I planned to be inside all morning; instead got a nice bike ride in plus a bit of overdue yardwork. 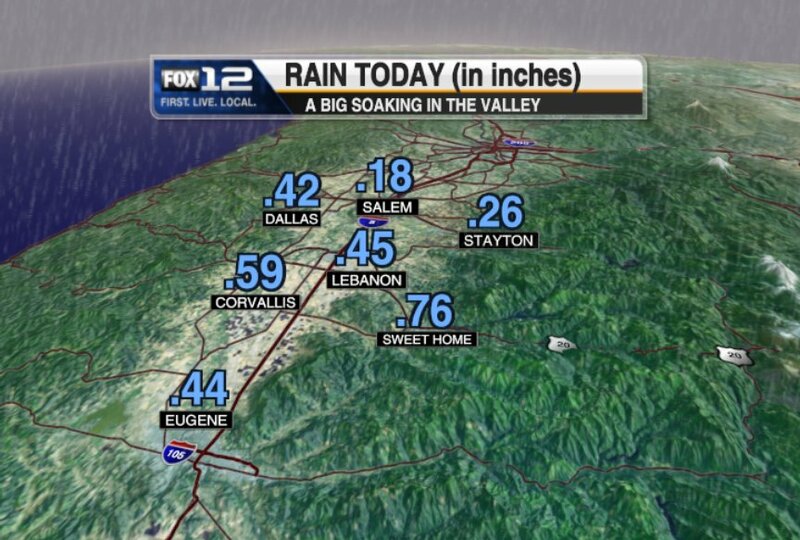 Today’s rain headed south…look at the totals. Around .50-.75″ soaking down in the central/southern Valley. That plus the .02″ that fell in Hillsboro gave Eugene and that city their first rain in 57 days! According to “HIO-Phil”, this was the 5th longest dry spell in Hillsboro’s history. Pretty impressive considering how it looked all during the month of June. Really, if someone would have predicted that back then most of us would have laughed. I’m always amazed at how quickly the rain faucet can suddenly shut off in early summer. A nice plume of subtropical moisture is streaming towards the Pacific Northwest right now. Actually it’s aimed a bit to our north, but it sure looks like the wet season. These systems that come in over the top of a ridge to our west (northwesterly upper-level flow) tend to be gloomy and wet. So August will end tomorrow very unlike the rest of the month. Not a ton of rain here in the lowlands; maybe just .05-.15″ maximum by evening. But then a 2nd juicier wave moves inland tomorrow night. Maybe another .10-.25″ with that one. So POSSIBLY up to .50″ here in the lowlands, probably less west side of the Valley and more up in the foothills. A nice wetting rain for the first time in 8+ weeks. I like the change on Thursday. Upper-level ridging pops up very quickly Wednesday night and Thursday. We go from gloomy skies midday Wednesday to good offshore flow and a much warmer airmass Thursday. We’ll make a change from October back to August in just one day. I like the variable weather myself…the air in September is always so fresh and cool after rain, then the warmth following always feels great. Not much else going on…pretty quiet in here. Wayne and I are working together for the first time since mid-July. Our vacations didn’t match up. But Shauna had to leave, so the “family” won’t be back together for awhile longer. There’s some good news in the weekend forecast…tomorrow looks great with lots of sunshine from Eugene north west of the Cascades. That includes the ocean beaches too. Sunday looks a bit cloudier, with low clouds early, then increasing high-level clouds in the afternoon. But a DRY weekend. 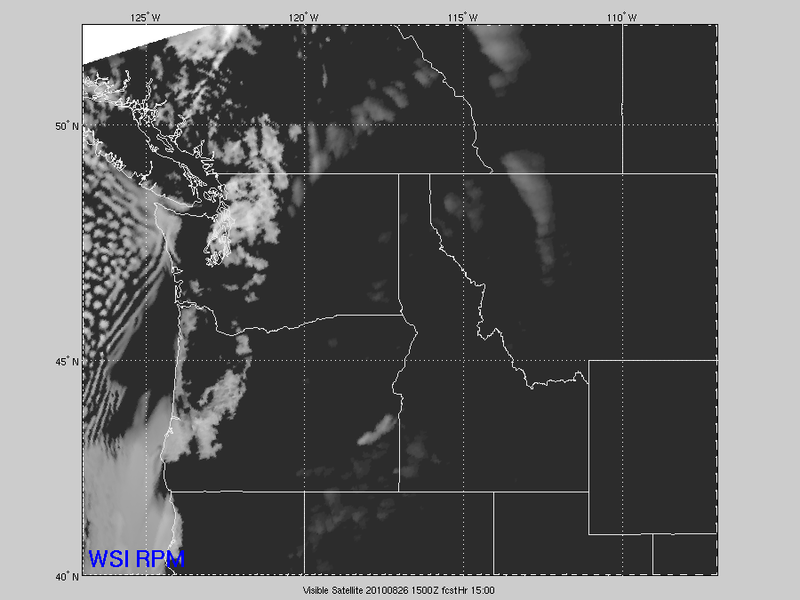 There is a system offshore right now that’s going to swirl down through the southern half of Oregon tomorrow. 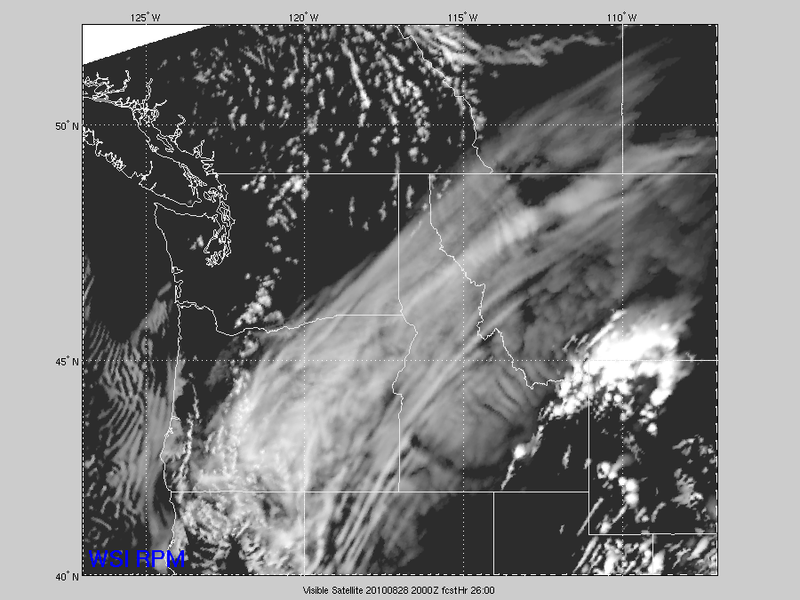 So Central/Eastern Oregon will be much cloudier tomorrow with a chance for a shower. You can even see some afternoon convective showers popping up over the Cascades too. Keep that in mind if you’re hiking up there…an afternoon shower is likely. Our model shows the situation around 1pm Saturday, click on it for a better view. What I’m excited about is the likelihood for rain Monday. It appears that we may actually have a rainy day as a chilly system dives in over us out of the Gulf of Alaska. My son, who returns to school Monday, suggested that it’s excellent because he doesn’t want to be in school when it’s sunny. For the hard-core weather folks: Notice the path of the system as it dives in on the 500mb charts, plus a nice surface low that curls down the Coast. Reminds me of those La Nina winters where surface lows come down at us from the northwest (low snow level)…a sign of things to come? That was the pattern for much of winter 2007-2008. Well, that aside, with decent dynamics and moisture, we could see .25″ or so even in the driest parts of the Metro. The WRF-GFS shows .50-1.00″ up on the west slope of the Cascades. Either way it’s going to be the first “settling of the dust” since the first few days of July. Along with that it should put a huge damper on firest burning in the mountains. The View Lakes Complex around Olallie Lake jumped to 5,000 acres the last couple of days. Probably 45 and rainy up there Monday! Beyond that it’s back to warm and dry Tuesday and beyond. I’ll be busy attempting to get a roof on my big summer project, or if we get to late Sunday evening…a nice blue “Whiskey-Tango” tarp. Everything proceeded pretty much according to plan today…plenty of sun, then clouds, then sun again. No showers in our area either. Amazing how the cold advection just levelled off temps this afternoon. I found northeast Oregon most interesting. Temps skyrocketed into the mid-upper 90s at La Grande and Baker City by noon! Then a massive push with the cold front…northwest wind gusts 40+ mph. By 5pm (normal high temp time), it was in the mid 70s. I see Timberline Lodge went from mid 50s last night and this morning down to the upper 30s by dinner time. It’s going to be real nippy for the Hood To Coast runners tomorrow morning. No big changes in my thinking for the rest of the 7 Day forecast…cool, but dry through the weekend. Then an actual front with steady light rain Sunday night into Monday. That’ll be the first time in about 8 weeks. As for the “cool” part, clear or mainly clear skies Friday and Saturday night could allow temps in outlying areas down around 40 degrees, with the usual really cold spots (Brush Praire, Orchards, Hillsboro, Vernonia) down into the upper 30s. I may have to break down and use the heat in August again…I really hate that, it’s unnatural. The point is that the general plan the next few days has been for a major marine push tonight, coupled with a cold airmass (for August) moving in overhead the rest of the week. 1. The airmass appears to be mainly dry through at least Saturday/Sunday. It’s a cold trough but just really dry. Models just aren’t generating much of any precip. Other than a possible afternoon shower either tomorrow or Sunday, I think the next real chance for rain isn’t until Monday as a somewhat organized system slides in on a northwesterly jet. 2. The 2nd change goes with the image above. The mesoscale models show that we don’t get a solid layer of clouds tonight inland, or along the coast for that matter! The mixing of drier air above appears to totally disrupt the stratified marine layer. Due to that, it’s quite possible a good chunk of the metro area starts sunny tomorrow and just gets a few puffy cumulus clouds in the afternoon. Combine that with a gusty northwest wind and it should be a nice refreshing late August day. Definitely not a gloomy “marine-layer” day…no chance for drizzle, just a sprinkle from one of those clouds in the afternoon…maybe. The image above is our RPM model around 8am. In the animation (you can’t see that part) you actually see the low clouds peel down off the coast as the drier air moves south after midnight. Friday should be a bit cloudier, but even then just lots of higher clouds. Saturday as the cold trough sinks over us we start clear…which means a very cold start, probably the coldest so far this late summer season. Then we get pop-up afternoon clouds with maybe a mountain shower. So…not a gloomy forecast at all, just some real “September Weather” for the last few days of August. It’ll be time to try and get a roof on the chicken coop and kids treehouse this weekend since the walls are all finished. Once in awhile we get a really spectacular viewer photo…today was one of those. It’s this morning on Rockaway Beach. 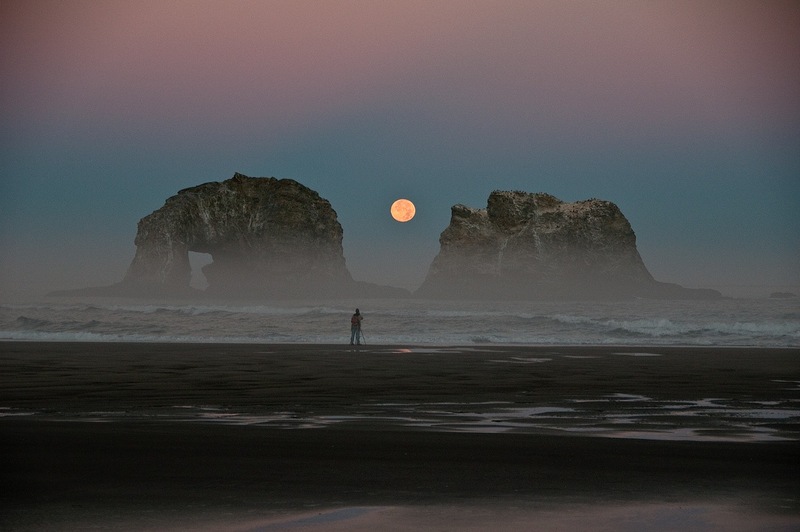 The setting moon between Twin Rocks. Don Best sent this one in. You are currently browsing the FOX 12 Weather Blog blog archives for August, 2010.